I wonder sometimes if we think of peace incompletely. It seems we only reserve it for sometimes as if we can only have or experience it on a very limited basis. Or, maybe that we'll only be able to experience the peace of Jesus when He returns...because He is the Prince of Peace. So, it's only for the future and not for now? What if we didn't reserve wishes of peace for only when someone dies? Don't get me wrong, it's important to pay our respects and wish someone the normal may you "Rest In Peace". But, what if we can rest in peace each day as we lay down to rest? Is this possible or is it too weighty to consider? Life is definitely not easy but what if we can experience peace during the craziest of times in our lives? What if we can experience peace even when we're awake as we battle the daily tasks, trials and burdens? I don't know about you, but, in my life I've been to some dark places and spaces where hope and peace didn't seem possible. I've been trough seasons of mentally, emotionally and spiritually hard times to the point that I wanted life itself to end. Then I turned to the Word of God and see peace throughout the scriptures...Real peace. 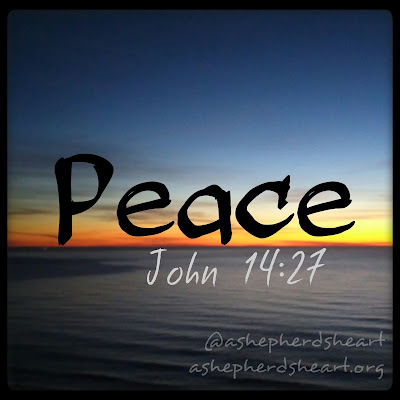 A peace that only comes from God! His peace and unconditional love is what caused me to want to live again instead of die many years ago. Jesus offers you and I His peace freely and we only need to accept it and allow it in every circumstance through His Holy Spirit. My friend, I don't know what you are facing but His peace is real! You can experience it right now as He freely will give it to you just call out to Him! Don't let another moment pass before you cast all of your troubles, pains, anxiety, hurt, sadness, depression upon Him and lie down and sleep tonight in real peace. Don't wait until you are on deaths door to experience His peace. My prayer is that you rest in sweet peace and rise in sweet peace. That you'll experience His peace tonight and each night ahead knowing that through every circumstance that He is with you always with arms open wide! Our ultimate peace will be realized in heaven but here on earth may you give all your anxieties and burdens to Him and pray for His peace to surround you right now no matter what you're facing. P.S. I purposely didn't list all of the verses that I could have listed in the above post as I want to encourage you to do a study on peace yourself. You'll be blessed as you study and see for yourself all the passages where God teaches us about peace.